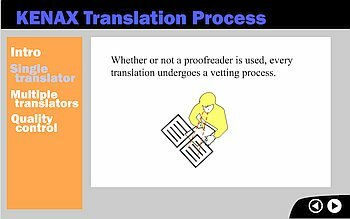 Kenax - World Class Translation Services! A Flash presentation showing our system of operation and quality control. Now Translating Over 220 Languages! "Finally, An Affordable Translation Service"
Why choose us for your translation needs? Kenax is backed by our exclusive cutting edge technology and a team of top notch translators. We provide you the very best translation services at the most affordable price possible. 24 hour Translation Services Available! Feel free to Call us when your translation services don't fit into a traditional 9-5 window. Our huge network of translators are available 24 hours a day to take care of your translation needs. Do you provide top notch translation services? Please consider joining our team of world class translation experts. All of our work is sourced on a centralized computer system making it possible for you to accept assignments 24 hours per day 7 days per week. Our team members enjoy consistent work along with professional support from a leader in the translation industry.